I read this article and found it very interesting, thought it might be something for you. 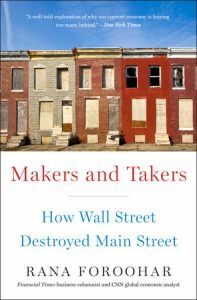 The article is called When Wall Street Owns Main Street — Literally and is located at https://evonomics.com/when-wall-street-owns-main-street-rana-foroohar-makers-takers/. In the midst of the housing crisis and Great Recession a few years back, I spent a lot of time traveling through the Inland Empire, a large metropolitan area in the middle of Southern California. It stretches an hour or two east of Los Angeles and Orange County, but is about as far away from the tony “OC” lifestyle as you can imagine. Made up primarily of San Bernardino and Riverside counties, the Inland Empire was at the heart of the subprime mortgage crisis and has yet to fully recover. In the early 2000s, predatory lenders flocked to the area, offering dicey deals to the largely minority and lower-middle-class white populations who, unable to afford housing on the coast, still craved the American Dream of homeownership. It ended, as it did in so many neighborhoods and cities across America, in tears and massive foreclosures, turning entire cities into ghost towns of derelict properties. As recently as 2012, when I visited the Del Rosa neighborhood of San Bernardino, one of the hardest-hit cities in the housing crisis, remaining homeowners’ efforts to keep their properties up were being thwarted left and right. Groups of young men and school-age kids with pit bulls in tow hung out in front of corner bodegas at midday. For every well-kept bungalow with freshly cut grass and potted plants on the porch, there was an abandoned building spray-painted with gang graffiti or strewn with dirty mattresses and empty liquor bottles. Highway billboards featured mainly ads for credit counseling, megachurches, and mobile home dealers. There’s a housing recovery on, but you wouldn’t know it in places like San Bernardino—and finance is one big reason why, not just because of its role in the crisis, but also because of its role in the recovery. Such communities are slowly healing, but many still struggle with residual blight from the housing boom and bust. Unemployment rates remain above the national average, mortgage credit is still tight, and few who’ve managed to hang on to their homes can hope to get anywhere near the prices they paid for them pre-crisis. But rents, oddly, are rising. In fact, in many parts of the Inland Empire, they are higher than the national average, despite the poor economic statistics of the area. One 2014 survey of a select group of renters conducted in Riverside, a city right next to San Bernardino, found that 63 percent of tenants were paying at least 30 percent of their monthly income in rent, a level that the US Department of Housing and Urban Development considers unaffordable (a full 33 percent were paying more than half of their income to landlords). 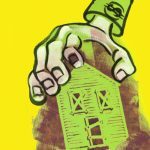 This strange paradigm, of working-class people in a not particularly desirable economic area paying more than they should for rent, becomes a bit more understandable when you know who their landlord is—Invitation Homes, the property subsidiary of Blackstone Group, the world’s largest private equity firm, and of late the nation’s largest purchaser of single-family homes. Thanks to its bucketloads of cash, economies of scale, and creative accounting, it’s managed to price many individual buyers out of the housing market over the last few years, cashing in on the recovery in housing, even as it made money before and after the crash. To be more precise, it’s a bet on the fact that fewer Americans can afford, in the wake of the financial crisis, to own a home. Thus an increasing number will be forced to rent from a Wall Street investor like Blackstone. Indeed, private equity’s rush into real estate goes some way toward answering one of the most perplexing economic questions of late: If housing is back, then why is the percentage of people who own homes in our country at a twenty-year low? Home values began rebounding from their post-financial-crisis trough in the beginning of 2012, and by July 2015, home sales had increased to their highest pace in eight and a half years. But the percentage of Americans who can call themselves homeowners is still declining from its peak in 2004, and many experts expect it to fall further as credit continues to be tight, young people struggle with higher-than average levels of unemployment, and baby boomers begin moving into retirement housing. Fixing this housing crisis, as Warren Buffett once told me, is a fundamental prerequisite for fixing our economy. And yet, nearly eight years after the crisis of 2008, we aren’t there yet. The national housing market is in recovery, but like the larger economic recovery, it is incredibly bifurcated. Sections of Washington, D.C., and Los Angeles are booming, while Detroit, Atlanta, and California’s Inland Empire are still coping with foreclosures and mortgages that are underwater. One study of the housing markets in cities and towns across America found that the top 10 percent richest markets, ranked by the aggregate value of owner-occupied homes, held 52 percent of total housing wealth, equivalent to nearly $4.4 trillion. The bottom 40 percent, by contrast, held only 8 percent. It’s a stark statement about who has profited, and who hasn’t, from the housing recovery. The federal government is still underwriting most new mortgages in one way or another, via a multitude of state-sponsored programs and federally backed bonds. If a healthy housing market is one that is stable, affordable, inclusive, and not primarily dependent on government life support, then “we’re a long way from there,” says Yale professor and housing expert Robert Shiller. How to create a truly healthy housing market is a question that matters to everyone, not just those of us who can’t afford homes. American consumers spend $2 trillion a year on housing, which triggers billions of dollars of additional spending in related industries like consumer goods, telecommunications and technology, automotives, construction, retail banking, etc. Research shows that rising housing wealth is much more likely to spur consumer spending than rising stock wealth is. Even after the crisis, people simply feel more economically secure when they own a home. And getting people to feel secure, and thus to spend more, is crucial to a sustainable recovery in an economy like America’s, where consumer spending accounts for 70 percent of GDP. Some economists have called on Americans to reconsider the model of home ownership as the cultural norm, arguing that it would make more economic sense for people to rent rather than own, since the former increases labor mobility and helps diversify investment risk. That may be true for some groups and in certain parts of the country—one thing we learned from the 2008 crisis was that heavy mortgage debts aren’t for everyone. But the American Dream of home ownership is deeply entrenched. Like it or not, a home, not stocks or savings, remains the chief financial asset for most Americans. And that’s likely to continue to be the case over the next several years, since returns from stocks are unlikely to match those of the recent past. Moreover, there’s ample proof that home ownership creates more economic and social stability in communities, since owners tend to be more civically engaged than renters and have a greater stake in the quality of local schools, parks, and playgrounds. Unfortunately, the economic climate and policy decisions taken since the 2008 crisis have resulted in a small group of rich investors— not American families—driving the real estate market and reaping most of the gains. Among them are private equity titans like Blackstone and high-wealth individuals who can pay cash upfront for a property. That’s reflected not only in the lower rate of home ownership but also in the swelling ranks of renters; an increasing number of people simply can’t afford to own, which has in turn dramatically tightened the rental market. Not since 1986 have fewer rental properties been empty in the United States, and rents are rising sharply in many cities as a result. One worry in the aftermath of the subprime crisis is that this dynamic, in which those without lots of cash and stellar credit (which is most people) have been left unable to buy homes, while Wall Street is able to continue to shape the housing market in ways that aren’t necessarily to the public benefit, will result in a spate of new soulless communities owned by investors who couldn’t care less what happens in them, as long as they get paid. If the markets are an ocean, private equity firms like Blackstone are the great white sharks that have perfected the use of debt, leverage, asset stripping, tax avoidance, and legal machinations to maximize profits for themselves at the expense of almost everyone else— their investors, their limited partners, their portfolio companies and the workers in them, and certainly society at large. During the 2012 presidential race, Mitt Romney’s candidacy spurred a vigorous debate over whether private equity firms create or destroy jobs on a net basis. The research can be spun in many ways, but the upshot is that employment generally declines in companies that spend too much time in private equity’s hands. Job destruction is particularly bad in the retail sector, although the other end of the spectrum has some firms in which private equity’s overall effect on jobs is modest at best. But what’s clear is that the private equity model, even more so than most Wall Street practices, enriches a few investors at great cost to others. Let’s not forget that while private equity firms may operate as owners (though they often aren’t regulated or taxed as such), they are essentially financial intermediaries; they make money not necessarily by growing the pie, but by taking an ever- larger slice of it. 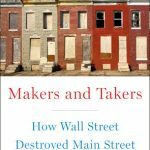 Adapted from Makers & Takers: How Wall Street Destroyed Main Street Copyright © 2017 by Rana Foroohar, Penguin Random House LLC. Is a Big Change Underway in Global Capitalism? 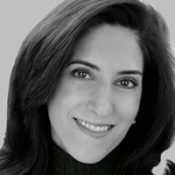 Rana Foroohar is Global Business Columnist and an Associate Editor at the Financial Times, based in New York. She is also CNN’s global economic analyst. 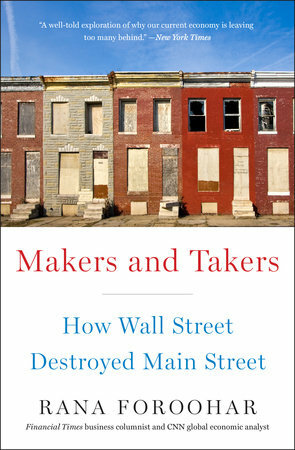 Her book, “Makers and Takers: The Rise of Finance and the Fall of American Business” (Crown), about why the capital markets no longer support business, was shortlisted for the Financial Times McKinsey Book of the Year award in 2016.